Your Fright Night festivities may be over, but the Halloween fun continues here at Inhabitots! Flip through all of your amazing pics from last night and upload the best shots of your kid’s handmade Halloween costume now — today is your last chance to enter the Inhabitots Green Halloween® Costume Contest! We’re awarding the top six costume crafters with great loot including an Oeuf Mask & Tail set, Yummy Earth lollipops, FEED Trick-or-Treat Bags to Benefit UNICEF, eco-friendly Halloween bags from ChicoBag, and Inhabischwag. Your Fright Night festivities may be over, but the Halloween fun continues here at Inhabitots! 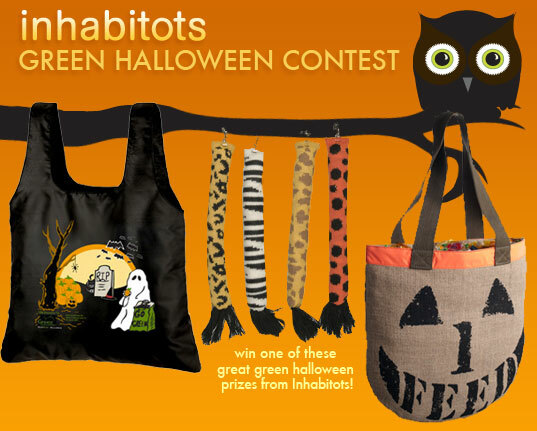 Flip through all of your amazing pics from last night and upload the best shots of your kid's handmade Halloween costume now -- today is your last chance to enter the Inhabitots Green Halloween� Costume Contest! We're awarding the top six costume crafters with great loot including an Oeuf Mask & Tail set, Yummy Earth lollipops, FEED Trick-or-Treat Bags to Benefit UNICEF, eco-friendly Halloween bags from ChicoBag, and Inhabischwag.